in and near Loro Ciuffena. 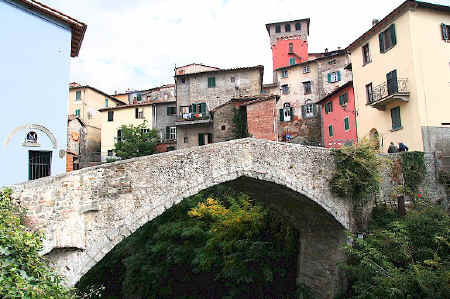 as are Scarperia in the Mugello, Poppi, Pitigliano, Cetona, Panicale, San Casciano dei Bagni, Montefioralle and Anghiari. Loro Ciuffenna, one of the most distinctive towns of the Valdarno Superiore, is located on the slopes of the southern ridge of Pratomagno at an elevation of 320 m (~1,050 ft), and has become a popular tourist destination during the past 25 years, with many English and Romans restoring houses in the villages high up in the neighbouring hills. The original road into town was over a Roman bridge, one of the seven along the route and there is still a fine mediaeval bridge over the deep ravine that divides Loro Ciuffenna into two parts. Much of the town centre is mediaeval in architecture, and one may view the ruins of a large water-powered mill, dating to before 1200 AD, that until quite recently produced chestnut and other flours. Available water power was an important contributing factor in the establishment of Loro Ciuffenna and neighbouring villages. The area where Loro Ciuffenna lies on the old road between Arezzo and Fiesole was inhabited in ancient times. Livy, in the twelfth book of his history of the Romans, Ab Urbe Condita, says that Loro Ciuffenna was founded by the Etruscans under the name of the torrent that passes through the town, Ciuffenna, which is undoubtedly of Etruscan origin. The Etruscans very likely also founded the nearby town of Gropina, the name of which is probably derived from the Etruscan "Krupina. Archaeological evidence suggests that Loro Ciuffenna became a permanent settlement in the 4 C when the original structure underlying the 9 C church of La Gropina was built. (The bell tower at La Gropina dates back to the early 1200s.) The town is mentioned in a document dated 939. The name Loro is used for the first time in 1050, derived from the Latin Laurus (bay tree), while Ciuffenna is the name of the torrent that dominates the layout of the town. "Ciuffenna" is given as "Iofinne" in a document of 1037 and is derived from the Roman personal name Clufennius, which itself is of Etruscan origin. The name of the stream was added to the original name of the town in 1863. With the paving of the Cassia Vetus road, Etruscan settlements saw a flourishing in trade and cultural exchanges, which promoted urbanisation and social development. The progressive abandonment of the Cassia Vetus and its replacement in the late second century BC by the more practical and direct Cassia Adriano which passes through the valley produced a general exclusion of the communities that developed in the hills, in favour of the centres closest to the new line of communication. Following the decline in Roman power, the communities of the Valdarnese plateau were periodically under the sway of the Byzantines and the Lombards. The local holy places show strong influences resulting from Lombard rule. Loro Ciuffenna later became part of the fiefdom of the Guidi noble family, before falling under the rule of Florence in 1293. Documents show that shortly afterwards, the area was subject to moderate interest by local powers, including the Bishop of Arezzo. The layout of Loro Ciuffenna retains the characteristics of the mediaeval village with its beautiful single-arched Romanesque bridge over the Ciuffenna. The mountains rise with spectacular steepness and height immediately above the town. Two of the castle gates remain, one being the tower gate (currently the clock tower) which was rebuilt in the late 1800's. The church of Santa Maria Assunta (formerly the chapel of the mediaeval castle) stands on the highest point of Loro Ciuffenna. This church was enlarged toward the end of the 14 C to surround a tower that bears the date 1333 above the architrave of the entry and that formed part of the ancient city walls. Among the interesting pieces housed here are 14-15 C frescoes, including the "Vision of St Elizabeth" and "Santo Martire" attributed to Mariotto di Cristofano, who was born in San Giovanni Valdarno, and a 16 C image of the "Annunciazione" by Carlo Portelli, a native of Loro Ciuffenna. On the road from Loro Ciuffenna towards Gropina, there is the early 17 C Santuario di Nostra Signora dell' Umilita notable for, among others works, a 17 C "Nativity of Mary" attributed to Matteo Rosselli, a fresco of the Florentine school (late 15 C) depicting the Madonna with baby, St Peter and St John the Baptist, and a 17 C vestment attributed to Agostino Ciampelli, on which is depicted "San Carlo Borromeo in adorazione del Crocifisso". Loro Ciuffenna, Italy Copyright © ammonet InfoTech 2010-2018. All rights reserved.